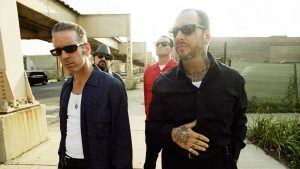 Here is your chance to see punk godfathers, Social Distortion! Social Distortion is heading to Bogart’s (2621 Vine St. Cincinnati) this Friday Oct 19. Doors open at 7 p.m. and the show begins at 8 p.m.
For the past 40 years, Social Distortion has continued to make an impact in the music industry. They were pioneers of the punk rock scene and have continued to find success in staying relevant and revolutionary. Come enjoy hits like “Don’t Drag Me Down,” “Reach for the Sky,” “Story of My Life,” “Ring of Fire,” “Don’t Take Me for Granted” and so many more. Ticket prices vary and can be purchased online at https://www.ticketmaster.com/social-distortion-bogarts-presented-by-cricket-wireless-cincinnati-oh/venueartist/180338/736149. For more information on this concert, visit http://www.bogarts.com/EventDetail?tmeventid=160054B0CAE16114&offerid=84097. Don’t miss this once-in-a-lifetime evening to experience punk rock legends, Social Distortion!